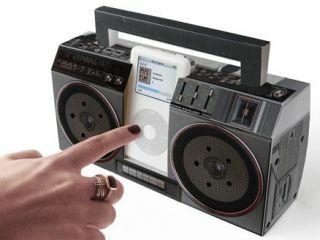 If you think that the idea of a cardboard boombox for the iPod is a bad one, just one look at the system's picture should change your mind. Sculpted to resemble an '80s music machine, the Cardboard iPod Speaker Dock is a fantastically cool looking piece of kit that should resemble something knocked up by a Blue Peter presenter, but is actually a viable speaker source for your iPod. Compatible with all iPods – and looking at the iPod in the picture they definitely mean both old and new – this retro-looking device comes flat-packed, so storage when not using it won't be a problem, and is available online from Nigel's Eco Store. Unfortunately, due to massive demand for the product, the Cardboard iPod Speaker Dock won't be available till mid-November. To alleviate frustration, however, you will be able to purchase it for the cheap-as-chips price of £19.99. Well, a touch under 20 quid is expensive for a piece of cardboard. But this is one with speakers and looks like a Back To The Future prop!